very tasty curry with literally no ingredients. tastes best with hot rice. 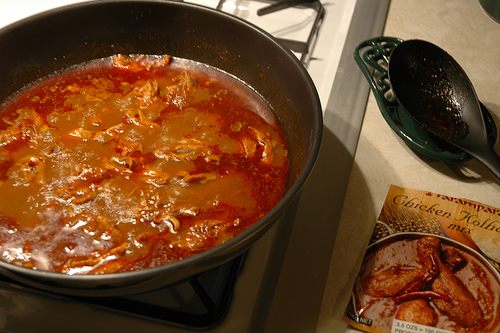 Cut chicken into medium size pieces. Heat oil and add chicken and haldi. Fry on high flame for 3 mins and add salt. Fry till chicken is well fried and gives nice aroma. Finally add chilly powder, mix and add water. Boil until gravy is of medium consistency. Note : It tastes best with right amount of frying. entire dish has to be cooked on high flame. I feel that 1 small cup of chillie powder is way too much for 1 kg of chicken, better to give the measurement in tablespoons. yes lalitha it comes with semi gravy..
it tastes really good...but i think it comes out as semi gravy...?